Mazda has always, as far as I can remember, had a reputation that matches it's "Zoom-Zoom" slogan. These cars that are made, first and foremost, to be fun to drive. Their cars have also been popular because of their Japanese heritage for better than average reliability and great value. I, however, have never owned or driven any of their products. This all changed last week. 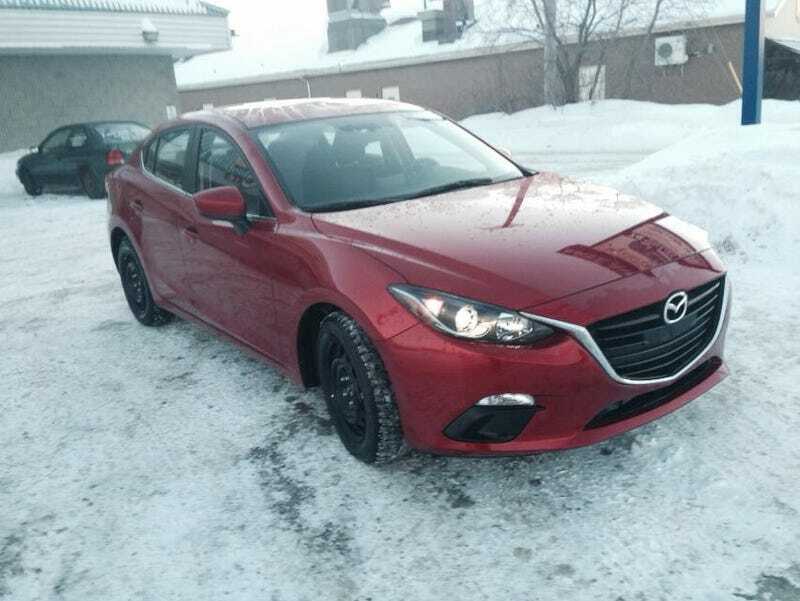 The redesigned 2014 Mazda3 caught my attention a few weeks ago, thanks to the various upgrades to the powertrains, chassis, styling and comfort. I decided to go to the dealer and try one. The rest, is history. So what do I think of the car overall? I won't go in depth about the slew of changes that were brought to the car for the new generation. I'm no automotive journalists and this has been done to death in the dozen or so professional reviews available online. I will, however, give you the details of this particular model's trim level: it's a 2014 Mazda3 GS Sedan with the 6-speed manual transmission and the Convenience Package. The closest American equivalent would be the Mazda3i Touring with every single option available to it except the Moonroof. The Juicy bits this package adds to the base 3 include AC, the Mazda Connect system with the 7in. touch screen and backup camera, premium cloth seating, rear spoiler, cruise control, 6-speaker audio, 16 inch rims and a bit more. The Convenience Package adds the following: Heated mirrors, automatic headlights, rain-sensing windshield wipers, heated front seats and leather-wrapped handbrake, shifter and steering wheel. So, it's pretty decently equipped. But how good is it? It's quite a stunner! Gone is the silly, awkward smile. Replaced by a similar shield-like grille that first charmed me on the CX-5. The overall design is sleek and a little aggressive looking, especially from the front, and finishes into a more contained, but sophisticated look when seen from the back. The new Soul Red that Mazda seems to be pushing like crazy in their advertising is a tricky color that may have some of you doubting it in person. I'm not sure if it's because of the pigment, the metallic flakes in the paint or a combination of both, but it looks different in different lighting situations. It ranges from a wine-red looking purple in low-lighting to something with a pinkish hue during a cloudy winter day to a nice metallic crimson in the showroom. I opted for it because I like reds and enjoy standing out in a sea of blacks, whites and grays. I must say it has grown on me and is quite stunning during the day, especially when clean. The final interesting aspect about the overall design has got to be the profile. I've noticed - And i'm not the only one - that it has a German, rear-wheel drive sedan style when viewed from the side, instead of looking like a traditional front-wheel drive compact. Though some of you might disagree. The interior is very, well, German. There are some clear inspirations from brands like Audi and BMW in details like the simplicity in the dash styling and the choice of a touch screen and control knob for the infotainment system. I find it rather elegant and mature. It oozes a lot of quality and class, which would have been unheard of in this segment 5 years ago. The fit and finish are excellent and the chosen materials feel upscale. The dash is a nice, soft-touch surface that feels pretty good to the fingers. The leather in the driver-related touch points has a nice texture and is definitely pleasing to the touch and makes the overall driving experience a lot more upscale on a tactile level. I personally prefer the piano-black center-dash trim over the aluminum look piece in the GT trim, but that's a matter of taste. There are a few demerits: The plastics around the center tunnel remind you that this is still a compact car, and the soft-touch material at the bottom-edge of the window on the front doors don't carry over to the rear doors, being replaced with budget hard plastics instead. The Gauge cluster is gorgeous yet odd. I love the styling , the speedometer and the digital information screen. The digital tach is nice but also less-than-ideal in a jalop point-of-view. But it works. There's plenty of information available like fuel consumption, trip, average speed and even current cruise-control speed and more. Everything is controlled via various buttons on the steering wheel. Did I mention that steering wheel is gorgeous? Oh and it features the now-expected assortment of buttons for audio, Bluetooth and cruise control. The front seats are very comfortable and supportive, feeling excellent for both long trips and canyon carving. Leg and headroom is excellent for yours truly who is 5'10" and, combined with the height adjustments(at the lowest setting of course) and the tilt and telescoping steering wheel, I had no issues finding the perfect position. The rear seats are standard compact fair. Roomy enough for most adults but nothing to write home about in terms of leg and headroom. Though my 6'1" buddy fits behind me with enough headroom to not hurt himself over bumps and his knees just barely graze the seat-back. He fares better in knee and foot room behind the passenger seat if it's adjusted to something reasonable. Firmness and comfort is about average for the class. Some might find them acceptable for long trips while others might prefer sticking to shorter stints. It's a little over 2800 lbs and has 155 hp and a decently wide powerband. It's nothing spectacular or neck-snapping, but it's enough to have some fun downtown and for decent and enjoyable highway passing. Torque is stop and go friendly down low and gets pretty decent past 3000 rpm. So far, I always seem to have enough power to either enjoy myself, or do what I need to do on the road. The difference is noticeable compared to the Fit. Official reviews ping the combination of the 2.0L with 6-speed manual at about 7.9-7.8 seconds to 60 mph. The combination of 4-wheel disc brakes with good initial bite, a firm and linear brake pedal and a brake force system that adapts to the pressure and speed at which you press the pedal to determine if you are attempting a panic stop all make for a very confident and strong overall braking performance. The overall feel is sporty and reassuring and you never find yourself wishing for more. The ride has got to be one of my favorite aspects of this car. The suspension tuning is excellent and sporty without being harsh. The difference an independent rear suspension makes for overall harshness on uneven pavement is pretty clear in this car. Overall the car is firm over rough roads but doesn't punish or jar you but reminds you of the sporty mission the Mazda engineers intended when they built this car. It feels very upscale, expensive and, once again, German. Now this is where the Zoom-Zoom mantra really shows! Though the steering is a little numb, it is very direct and nicely weighted. Combined with the ultra-responsive chassis and sports car-like suspension setup and geometry, and you end up with a car that just begs you to flog it in every single turn and corner. The handling is quick, precise and extremely well balanced. Turn-in is sharp and the overall behavior very neutral, feeling like the pivot point is the driver's seat. Some reviewers have compared it to a rear-drive sport's car and, from my own experience(my Mustang), I'm inclined to agree. An interesting note is how effective the sway bars are at keeping the car flat under cornering. I challenge anyone to try to rock one of these cars sideways on it's own suspension. The sway bars on this car make it harder than it felt in my mustang when it was stock. Overall: Delicious! It's a 6-speed manual gearbox engineered by the same people who build and sell the Miata. Do I need to say more? The clutch is great with the right amount of travel, good feel and easy modulation. The shifter action is short, a bit weighty and a tad notchy and it feels very mechanical. It reminds me a lot of my mustang's shifter, with less notching of course. A joy to use. Engine noise is alright. There's a nice but muted growl at low RPM. When you climb the tach, however, things start to sound a bit more like a turbine with more air and less mechanical action in the noise. It's not bad or annoying in any way but it's not inspiring or sporty either. Some breather mods would help in the audio department. Now, for the sound system itself. I must say I have not had the pleasure of sampling the Bose 9-speaker system, though I'm sure it's great. The 6-speaker mid-range unit in my car, however, sounds pretty amazing for a mid-range factory sound system in a compact car. Heck, it sounds good, period, to my slightly audiophile ears and I likely will never feel the need to upgrade this. This is another aspect of this car that is a leaps and bounds upgrade over the fit. It's a nice balanced sound that has good clarity and decent high performance with enough bass to satisfy the average Dubstep and dance music junky if you crank up the settings. I should also mention that there are zero door or dash rattles when you "crank" up the volume. Nobody ever bothers to check for this in a car but it has a big impact in music enjoyment and a lot of vehicles still suffer from this affliction (Like my dad's 2010 F-150). This car has plenty of toys: Rear-view camera; power everything; steering wheel buttons galore for everything; voice controls, driving information-rich gauge cluster; 7 inch display centered multimedia display with AM/FM, CD, Aux, USB(2 ports! ), Aha, Stitcher, Pandora for all your music needs, a fuel economy statistics page(pictured above), a display center for more detailed information about the various idiot lights you might experience and available GPS Navigation (I did not get that feature installed but it can be added at any time by the dealership). The whole shebang can be controlled via, again, the steering wheel or by the iDrive like control knob behind the shifter that is surrounded by just the right amount of shortcut buttons and flanked by a small volume knob. The whole setup is extremely effective and intuitive with a short learning curve. Though you may sometimes find yourself thinking there are a couple steps too many to get to where you wanna go. Value is extremely subjective, so, I won't comment further on this. All I can really say about value is: I bought one for myself.